Thank you for your interest in employment with the Texas Facilities Commission (TFC). The Human Resources office posts all job vacancies and makes all job offers for TFC and is located at 1711 San Jacinto Boulevard, Austin, TX 78701. 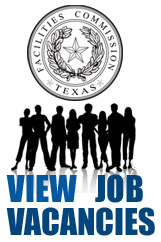 To apply for a state agency job with TFC, you must complete the electronic State of Texas Uniform Application for Employment through www.WorkInTexas.com. For more information, please call the Human Resources office at 512-463-3433. If the job seeker is included in the interview pool, the Human Resources office will contact the individual to schedule an interview. The Texas Facilities Commission is an equal opportunity employer and does not discriminate on the basis of race, color, religion, gender, national origin, age, or disability. TFC provides accommodations for persons with disabilities in accordance with the Americans with Disabilities Act. If you need help with the employment process or require other accommodations, please contact the Human Resources office for assistance at (512) 463-3433. The Texas Facilities Commission complies with the provisions of the veterans and former foster child employment preference acts. Any complaints regarding failure to comply with these provisions should be reported to the Human Resources office at (512) 463-9996.